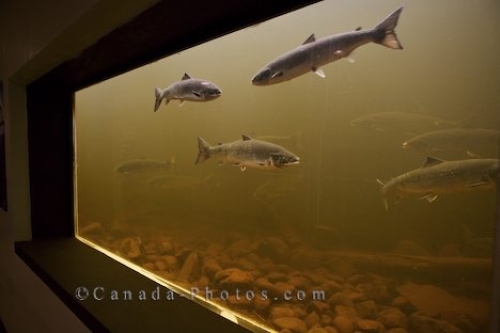 Through the window, people can watch the Atlantic Salmon as they make their way up the fish ladder at the Salmonid Interpretation Centre in Newfoundland Labrador. Large windows let visitors to the Salmonid Interpretation Centre in Grand Falls-Windsor in Newfoundland Labrador, Canada have a close look at the Atlantic Salmon. As the fish jump up the fish ladder, people can learn about their habitat and the life cycle of these Atlantic Salmon. Atlantic Salmon seen through the window along the Fish Ladder at the Salmonid Interpretation Centre, Grand Falls Fishway, Grand Falls-Windsor, Trans-Canada Highway 1, Newfoundland, Newfoundland Labrador, Canada. Picture of Atlantic Salmon along the fish ladder at the Salmonid Interpretation Centre in Newfoundland Labrador, Canada.